—"Did the earth move for you, too, my darling?" —"It sure did, and I was in the other room!" The black & white photos on this page are from the 1960s. I've seen them before and have even stood personally at a few similar scenes. They are from a book entitled The Subsoil of Naples, specifically the chapter on movement in the subsoil that leads to such episodes. Actually, the history of serious collapses is not that ancient. The Greeks and Romans built old Neapolis on pretty solid ground, down almost at sea-level and on ground that was just a few feet above solid tuff rock. They also dug out a vast array of underground caverns outside Naples for stone blocks for city walls and buildings. Note that they dug outside the city and on the slopes. They did use some of the sites for burial, but they did not put their dwellings near them, on top of them, or below them because the real peril in those caverns is not that they are unstable, but rather that they collect water. In the case of Greco-Roman Naples, when water collected and gushed out and ran downhill towards the city, there was a convenient river running east-west below the north city walls to take the water. I think I have always connected the frequent episodes of large-scale, disastrous movement in the subsoil with those caverns; that is, that somehow all the holes in the hills disrupted the stability of the region. As it turns out, water is the real culprit —or, better, our inability to handle the water. The kind of damage seen in these photos, however— full-scale collapses of buildings and retaining structures and the opening of sink-holes in streets—is not caused by erosion but, rather, by erosion's Evil Twin, siphoning; that is, the rapid action of water flowing downhill (geo-geekspeak calls this "with a high hydraulic gradient") through soil and taking much of that soil with it and leaving whatever is above to fall in. It takes place in the presence of looser terrain, but since the old city was built on flat, solid rock, there was none of that going on. That didn't happen until Neapolitans starting building on the slopes of hills, where there was often a considerable amount of loose terrain on top of the underlying tuff. So, you expand onto the slopes, overbuild, put in a new aqueduct and sewer system (1880-1915) and then run hitherto unheard of amounts of sorely needed water beneath all those new homes and hope that none of it leaks. Boy, are you an optimist. Historically speaking, even the Spanish in the late 1500s forbade digging into the slopes of hills above the city for construction material. In order to get to the rock, you had to loosen a lot of overlying loose terrain that could then wash down onto the buildings lower down, but, again, there was nothing particularly unstable about digging holes in solid rock. In 1781, Ferdinand IV issued an edict to try to put a stop to the chaotic building practices of the day. 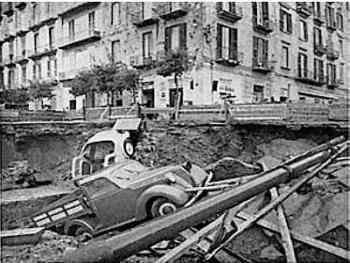 It declared that the cause of so many cases of collapse of buildings was the practice of digging "underground caves and grottoes" for the purpose of extracting stone for building material. He made the same mistake I did. If there were collapsed buildings in the middle of town in the 1781, it was because they were very old and/or not constructed properly. It was not because the weight of the house was trying to rest on empty space beneath it. Of course, by that time, the city had already built itself up the slopes to a considerable degree. Ferdinand even had a residence all the way up on top of the Vomero hill and an additional palace on top of the Capodimonte hill. 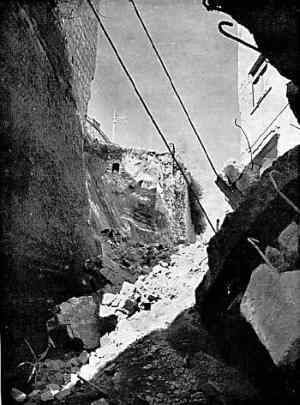 In the post-Risanamento euphoria (1915-onward) of having a new aqueduct and sewerage system, it isn't clear that the new builders understood the downside of what they had just built. 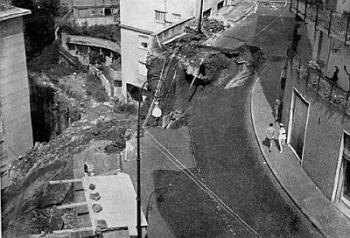 Studies done in the 1930s through the 1960s examined a list of possible causes for the collapses that were starting to occur. There were peripheral factors, such as age of buildings, improper construction, increased vehicular traffic, even the after-effects of WWII bombing and earthquakes. The fact remains, however, that virtually all of the episodes of large subsoil movement and resulting damages have occurred in the last 100 years (and most of it since 1960) in the same areas—the slopes of the hemisphere of hills around Naples, and the cause has been water leaking into the subsoil from the aqueduct and sewerage system. It then becomes a very laborious and necessary process of finding leaks and patching them. It is too late to stop the wild overbuilding on the hills in Naples; that chapter is, unfortunately, written. BUT you have to insure that all new construction follows a solid building code that keeps tabs on foundations, retaining walls, terraced slopes, pressure in the water and sewer mains (especially that! ), even such things as whether landfill has been sufficiently packed down. I learned a new expression in Italian while researching this: alla rinfusa. It means higgeldy-piggeldy or helter-skelter. We can't have that.